Send Harry Potter Theme Cake - 2 kg to Chennai. Gifts to Chennai. Send Cakes to Chennai. Description : Chocolate cakes are loved by all. 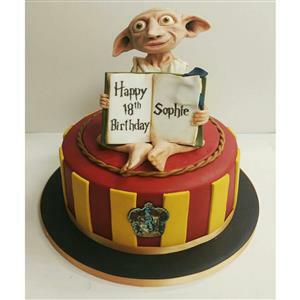 Hence, amaze your dear ones in India by sending this harry potter theme chocolate cake from Giftstoindia24x7.com. The cake taste delectable and your dear ones will be overwhelmed to receive this chocolate cake as gift. Send other Gifts to India with this cake. Weight : 2 KgsPlease Note: You have to give 24 hours advance order. The cake will be delivered in main cities only and the look of the cake may vary. Picture is indicative. Actual might vary.